Despite collecting miniatures, painting miniatures, and writing about miniatures all the time, I haven't actually gotten a chance to play 3rd edition Warhammer for over 15 years. So I was delighted when my fellow Oldhammer fanatic, 24_Cigarettes, asked out of the blue if I wanted to meet up in Toronto and throw a game together. His beautifully painted and based Skaven Army, Clan Scourge, showed up at my house yesterday with half-a-case of beer and a bottle of whisky, and we set to work. The home team was represented by my 1000 point Orc army, Krapfang's Backwood Bandits. For those of you out there who are curious about how to throw together a deadly orc force, I encourage you to skip over the following army list, which betrays my utter lack of experience at actually trying to beat anyone in a game. My orcs eschew everything that would actually help them win: magic ("no sissy stuff"), goblin fanatics ("dey harsh da mellow") and war machines ("wot, are yoo lot stunties?"). I just wanted a big army that got the maximum amount of my lead on the table. 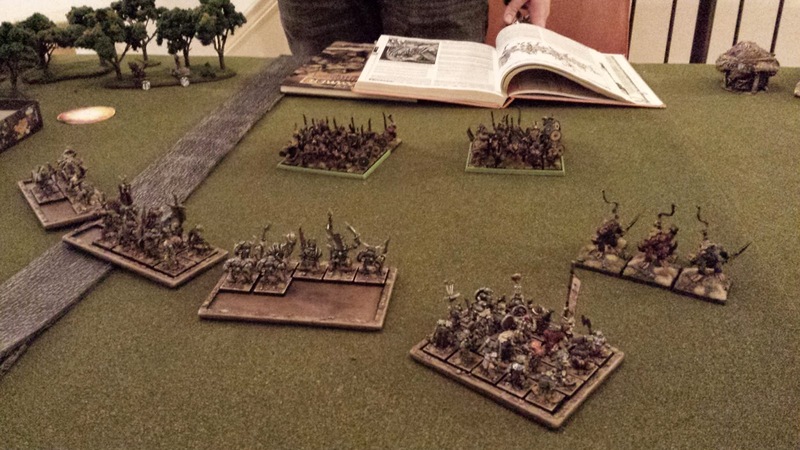 The orcs deploy in a long line while the Skaven player positions his Clanrats in a tight formation. The Giant anchors the orc middle. This was a mistake. On the other hand, Clan Scourge was a model of elegant design. 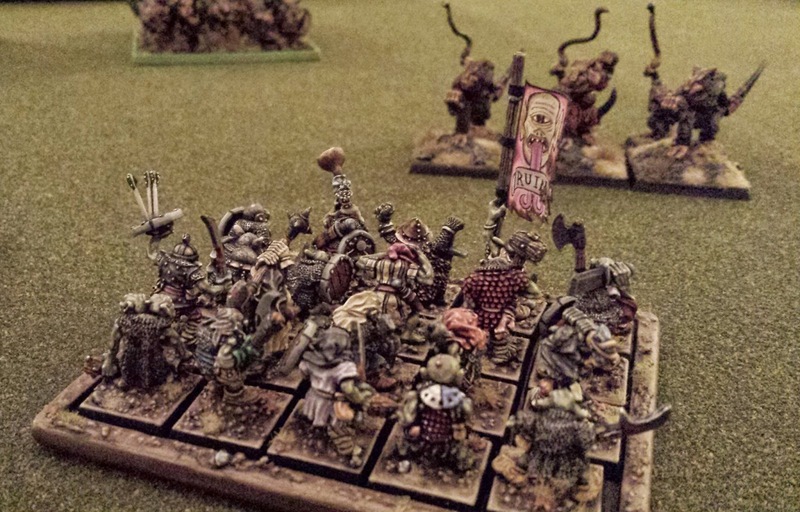 It was certainly not the work of rules-lawyer or a win-at-all-costs competitor, Rather, 24_Cigarettes' Skaven army was simple, balanced and very ratty. The centerpiece of his force was two huge units of Clanrats, each bolstered with a Clan Skyre Warpfire Thrower (to punish the orcs for keeping their distance) and a Clan Pestilens Plague Censor Bearer (to punish the orcs for getting too close). "Arl need 'nuther cider fore I bash dem ratters." The battle started off with my Giant Rotwang failing his drunkenness roll and showing up for the battle snozzled. 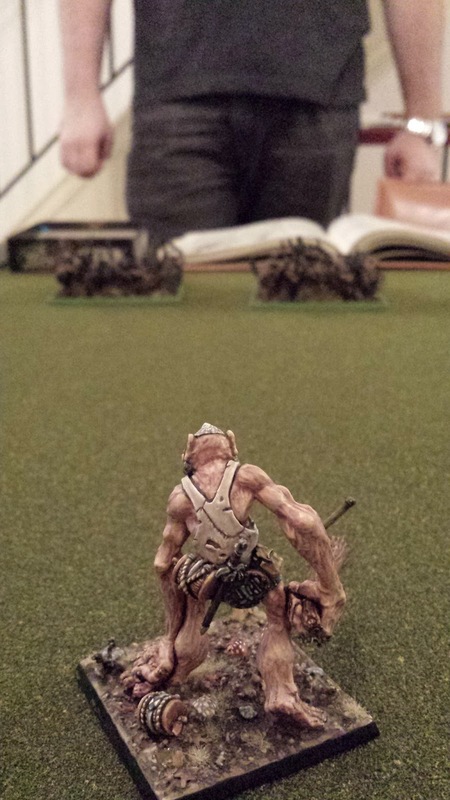 Instead of charging into the ratters like a good boy, he sort of staggered toward stage left, giving the Skaven Warpsquealer time to cast Cause Panic upon him. Under the influence of this spell, Rotwang caught a terrifying glimpse of sobriety and booked it off the battlefield. The rest of my army marched doggedly up the centre and into a hurricane of Skaven flame, fumes and Jezzail shot. Only a feeble green rump emerged from this onslaught, and it was no match for the massive phalanxes of unhurt Clanrats. 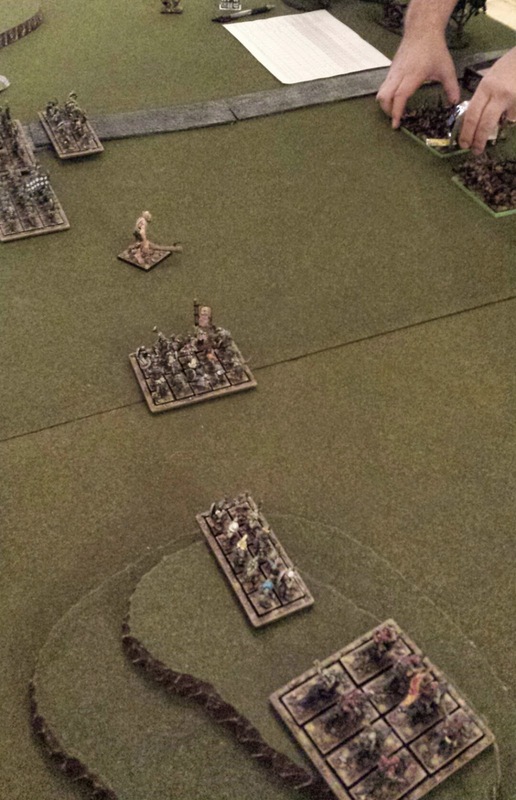 A daring flank attack by Warspoor's Gobbo Wulfboyz offered a glimmer of redemption, but it was only a glimmer: the tide of rats swamped the orcs and drove them from the field. The orcs attempt to flank the skaven, but are decimated on the right by the fiery weapons of Clan Skyre and menaced on the left by the rat ogres of Clan Moulder. "Oi boss! Why are doz big 'airy finks coming dis way?" 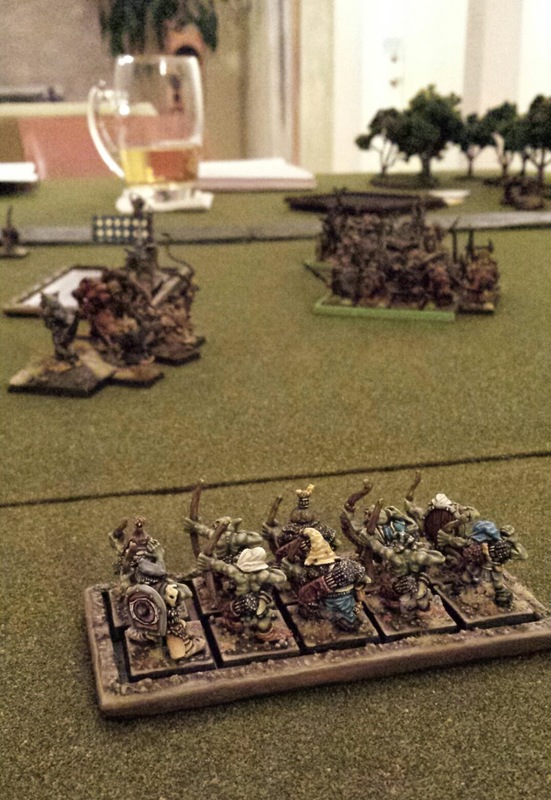 From the safety of the far left flank, the small unit of goblin archers watches the rest of the army getting eaten. In their extreme terror, they have a vision of a cider. Besides being beaten like a gong, I had a great afternoon. Seeing two carefully painted armies on a table is among the most satisfying feelings I know (leaving unnamed a few other satisfying feelings). To make matters even better, 24_Cigarettes is a mensch, and I can now look forward to many future afternoons of drinking and fighting. I just need to work on army design, and keeping my Giant (if not myself) on the wagon. You're too kind sully. I did my write up as well but yours is much better, just like your painting! I don't know what a mensch is but I hope it's something good. Thanks for a great game again! Mensch is a Yiddish term I picked up from some friends of mine. As Wikipedia says, "Mensch (Yiddish: מענטש mentsh) means "a person of integrity and honor... The term is used as a high compliment, expressing the rarity and value of that individual's qualities." Looking forward to our next game! I take that as a very high compliment sir, and thank you. Cannot wait until our next engagement! I finally got around to reading your write up after reading 24_Cigarettes' version the other day. I've also committed to following your exploits going forward. I look forward to seeing many more match ups between you and 24_Cigarettes. 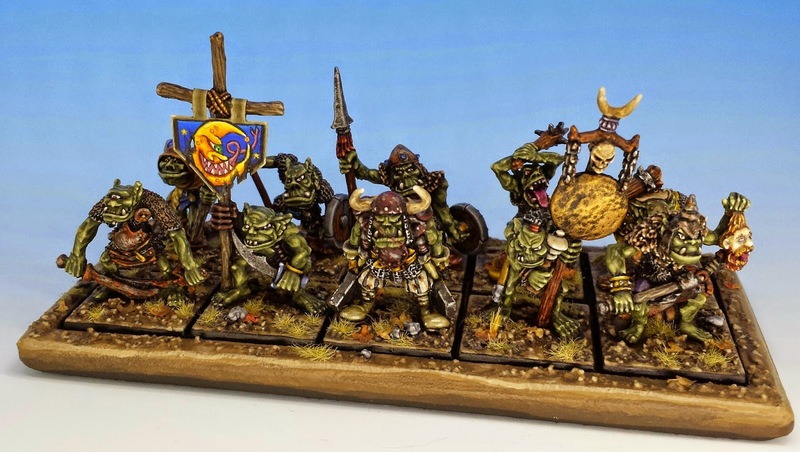 Some of the most beautifully painted Oldhammer greenskins I've ever seen! Well done! Thanks so much for all the awesome comments. More orc pics to come soon!